We're in the thick of fashion month, everyone. We already marveled at the slew of shows during fashion weeks in Copenhagen, New York, and London, and now we have Milan on the docket. 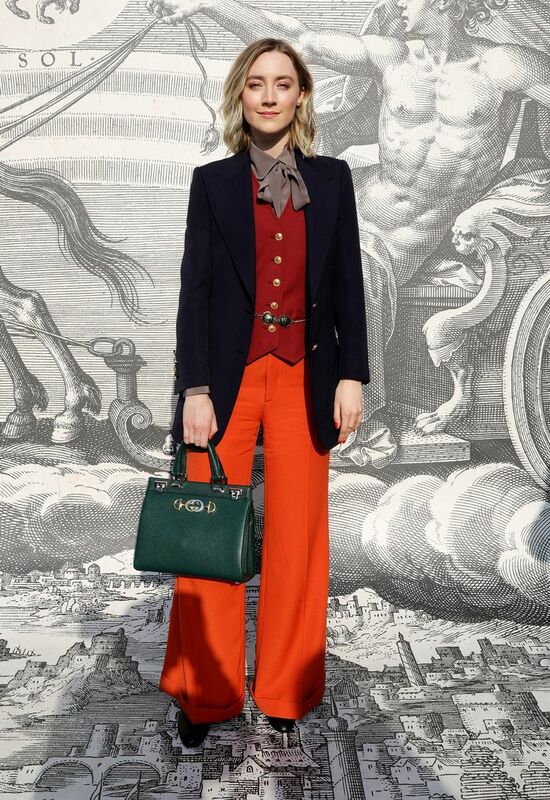 Of course, Gucci is a Milan mainstay and never fails to draw an A-list front row. This season, I noticed more than a handful of attendees all wearing the same trend: suits. Pantsuits and skirt suits reigned supreme, with Saoirse Ronan, Gia Coppola, Lou Doillon, Lucy Boynton, and others all wearing different versions of the trend. The show comes a few weeks after the brand faced backlash over a sweater considered to resemble blackface. The company issued an apology and promised to make amends. "We are fully committed to increasing diversity throughout our organization and turning this incident into a powerful learning moment for the Gucci team and beyond," the brand said in a statement. The runway reflected the brand's commitment to diversity and featured a smattering of different trends, including gilded necklaces, visors, sculptural earrings, and more. Scroll down to see what celebrities wore to the Gucci F/W 19 show in Milan. Next up, the seven trends I spotted at Copenhagen Fashion Week.